Air Fryer meals are on my mind lately. Everyone has enjoyed the recipes that I’ve been making in the air fryer from crispy air fryer chicken wings to the air fryer donuts in special shapes. 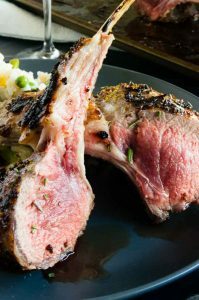 This week I’m stepping away from the more basic things you think of when thinking of air fryer recipes and making Air Fryer Lamb Chops. 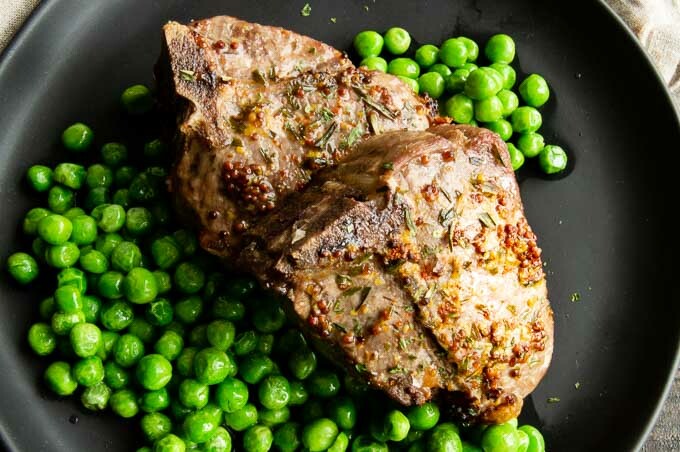 Lamb chops are an easy weeknight dinner you can have on the table in less than 30 minutes. 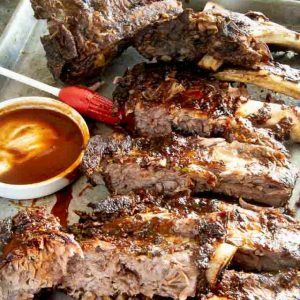 I’m sharing a simple sauce made of just 4 ingredients you can make on the spot and not have to let it sit in the marinade to get the delicious flavor. 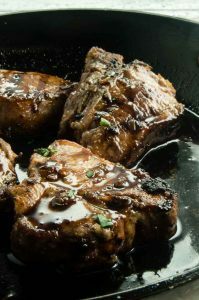 The sauce to brush over the lamb chop is made with mustard, a smidge of oil (for browning) lemon juice and tarragon for a simple, but elegant compliment to the lamb but can also be used on chicken or steak. You can make the obvious from chicken wings, frozen and fresh French fries or anything you think of frying. But you can also air fry chicken parmesan, pork chops and todays recipe for Air fryer lamb chops. I can see everyone thinking wait, what? I don’t deep fry lamb chops, or chicken parmesan but you want me to use the air fryer for these? Yes! The air fryer is an excellent choice for cooking foods a little bit healthier and has an added bonus of quick cooking and easy clean-up. Once you’ve started cooking in your air fryer you will be amazed at all the air fryer recipes you can make. I’ll be sharing one recipe a week over the next few months for you. PIN THIS TO YOUR AIR FRYER BOARD ON PINTEREST! To understand why your air fryer is such a valuable kitchen tool you have to understand what exactly an air fryer is. It’s kind of deceptive. I knew you could make things in an air fryer without all the oil but until I got mine I had no idea what an air fryer really was. The big secret about an air fryer? It’s not a fryer at all!! It’s basically a counter top convection oven that cooks using really hot air swirling around. It can cook basically anything you can fry or bake in an oven although some things work much better than others. Air Frying is a healthier way to cook because you hardly use any oil. An added bonus not using oil is the lack of lingering grease smell after you’re done cooking. Air Fryers are super easy clean-up, the pieces easily fit in the dishwasher. Your kitchen and house don’t heat up using an air fryer. I use a Phillips Air Fryer but all air fryers work pretty much the same. Costco has them and they are reasonably priced. I like the Phillips air fryer because its got a little larger basket to cook in than some of the others. 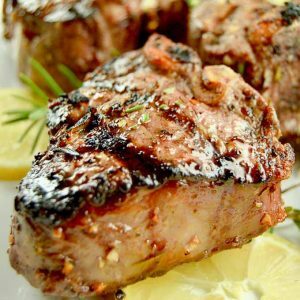 How to make lamb chops in the air fryer? 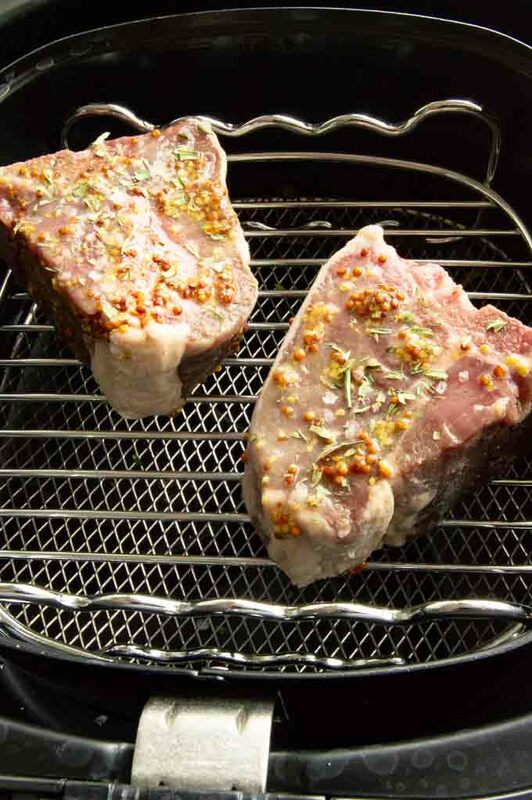 You can also use a rib chop easily but the cooking time will be much less since they are much thinner and they are not as forgiving if you cook them too long. Look at all of the juices from the air fried loin lamb chops on the knife . Make a simple sauce/marinade to brush on. It can’t be any simpler. In a small bowl mix mustard, olive oil, tarragon and lemon juice to lightly brush on the chop before placing the meat into the air fryer. Why I use oil in an Air Fryer. Wait? I know you are wondering why I am using oil in the air fryer. With a piece of protein I like it to brown a little bit more than it does if you don’t use olive oil in the air fryer. The meat cooks so quickly that it doesn’t really have a chance to get browned with out a little olive oil to help it along. Preheat the air fryer while you are making the marinade and brushing it on. 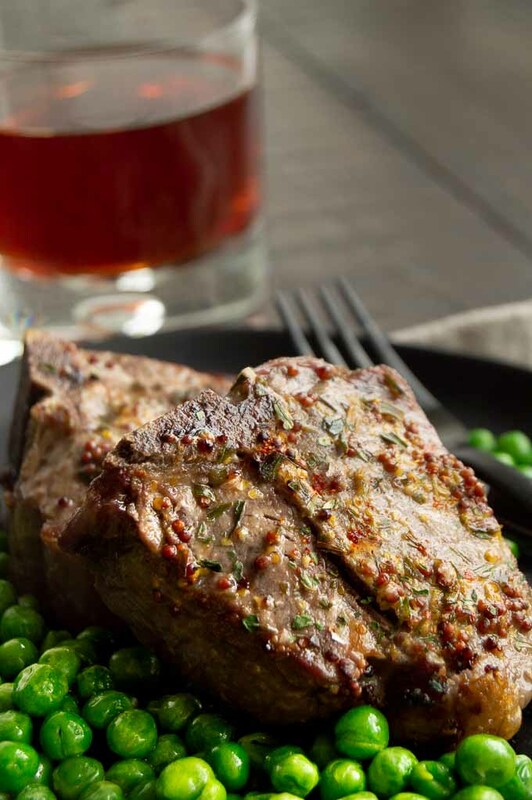 It only takes three minutes to preheat but by preheating the air fryer the lamb chops will start cooking immediately. Leave space between the foods. Leave a little space in between the lamb chops when you place them in the basket so the air can reach all of the sides of the lamb. I have two lamb chops pictured, but I could easily fit up to 5 in my air fryer basket. If you are cooking for more people, cook in batches and place the cooked lamb chops on a side plate and cover with plastic wrap or turn your oven onto 250° to keep them warm. 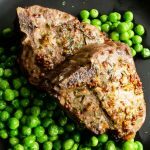 Is lamb a healthy protein? Lamb fits the requirements of what the FDA classifies as a lean meat so yes it’s a healthy meal choice. 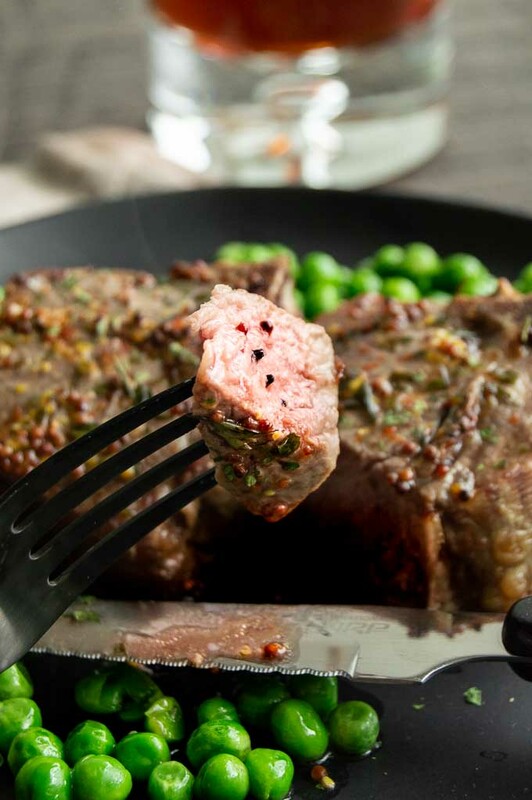 American Lamb has lots of nutritional information if you want more specifics but a 3 ounce cooked portion of lamb is less than 8 grams of total fat with 3 grams being saturated fat. 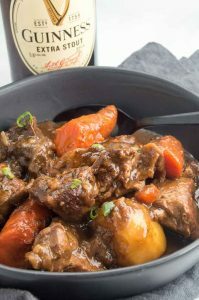 Lamb also has less than 80 mg of cholesterol. What temp should lamb be cooked to? If your chops are a different thickness the cooking times may be slightly different. You can use a thermometer to test for doneness if you would rather not just cut into it to check it. Here is a handy doneness guide to test the lamb. Heat a grill pan or a skillet to high. Add one tablespoon olive oil to pan and swirl to coat all sides. 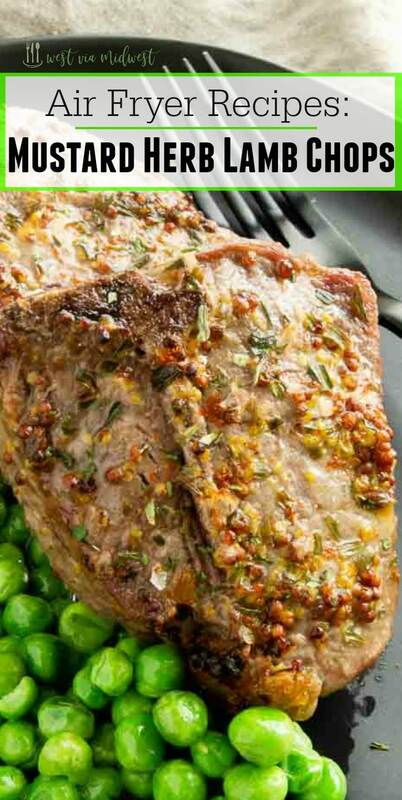 More Lamb Recipes you might enjoy! 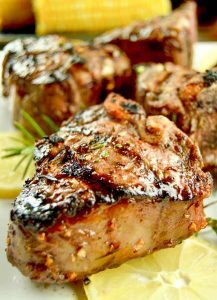 No Fail Grilled Lamb Chops Perfect for entertaining! 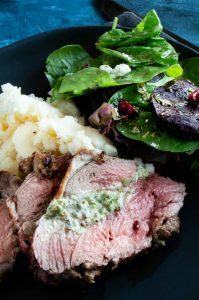 No Fail Leg of Lamb Make this for Easter and you won’t be disappointed! Rack of Lamb Special Occasion meal without stress! Let’s stay connected! Be sure to follow me on ~ Instagram ~ Pinterest ~ Twitter~ Facebook ~! If you tag your photos with the hashtag #westviamidest or tag me @michele_westviamidwest and I’ll showcase your photo on our IG Stories! I love hearing from you and be sure and drop me a line if there are recipes you would like to see made in the air fryer! Turn on air fryer to 390° to preheat. Into a small bowl place mustard, olive oil, tarragon and lemon juice and mix well. Rinse and pat dry lamb chops with a paper towel. Brush mustard herb mixture over all sides of the lamb chops. Place lamb chops into basket with some room in between. You can do them in batches and keep on a plate covered with plastic wrap until all are finished. Alternatively you can place in a 225° oven to keep warm. Cook for 15 minutes for medium rare (turning at 8 minutes.) You don't have to turn them but I like the even color it gets by moving them around. You can use a thermometer to test for doneness. The width of the chop used can alter the cooking times. If you don't have a thermometer I use a knife to cut into one to test. All nutritional information is based on the ingredients I purchased to make this recipe. The ingredients you use will effect the finished result. If you are following specific dietary guidelines please check the ingredients you use to calculate an exact number. The lemon mustard sauce made these taste amazing!!! SO delicious! 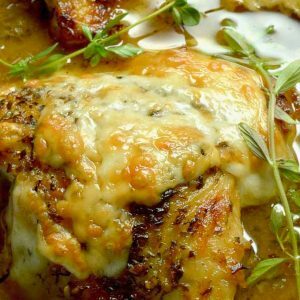 Love the mustard lemon sauce! Lamb chops are a special occasion meal for us. Excited to learn to make them in the air fryer! I loved it! It was so easy and so taste so good!! 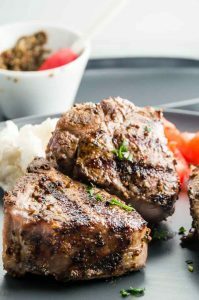 These look so wonderful – I never would have thought to make lamb chops in an air fryer! 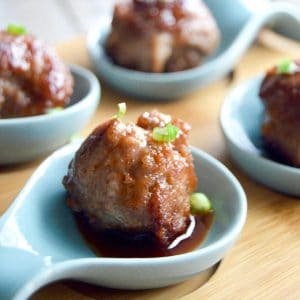 These are really good, and so easy to make!